When you install Microsoft Windows Vista, it asks you to create an account which it gives administrator rights to. However, behind the scenes it also creates an account called “Administrator”, but by default it is locked out. It also doesn’t tell you what the password is for this account. If you ever need to activate the hidden Administrator account, here’s how you do it. Log in as a user with administrative privileges. Click on the Start Button, then in the “Start Search” box type “cmd”. When “cmd.exe” pops up in the list of search results, right-click on it and choose “Run as administrator”. 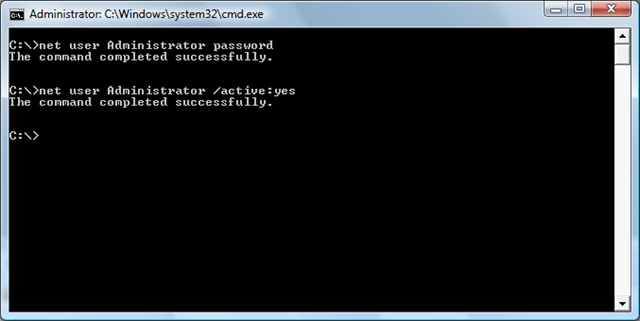 In the command prompt window, type “net user Administrator password” and hit return, where password is the new password you want to assign to the Administrator account. Type “net user Administrator /active:yes” and hit return. Log off from the current user, and now you should be able to sign in as the Administrator account.